A Utopia is a comprehensive order, and it is significant that the devisers of imposed Utopias are invariably those people, organizations and races who manage their own affairs worst. Observation of political affairs, and some experience of life, has convinced me that the real Plotters, while having the clearest possible conception of their own objective, rely in the main on the devisers of the Utopias to provide them with a ready-made popular propaganda. Written in 1941, the events to which reference is made in this work of the late Major C.H. Douglas are prior to that date. 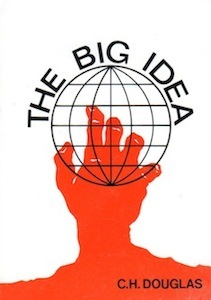 Subsequent events have merely confirmed the facts exposed in these pages that The Big Idea is a deeply rooted conspiracy, Satanic in conception and nature, for the destruction of what once promised to be a developing Christian Civilisation, and the enslavement of mankind under a ruthless dictatorship. It is, therefore, not surprising that this attack should have as its focus the Christian Church, Christian doctrine and Christian influence in human affairs, and that it should emanate from traditional anti-Christian sources.